It’s perfect timing, really. Now that Thanksgiving and the holidays are over, it’s high time to load up on some of those delicious grocery store sales. You know: the $1 festive cake mix, the 50¢ box of candy canes. This time, though, it was the $1.24 canned pumpkin that caught my eye. And then I wondered what exactly I could do with pumpkin. I tried making a mousse, consisting of just pumpkin and marshmallows. I tried eating it straight from the can. I tried freezing it into a pumpkin ice cream. It was actually worse than eating it straight, and I’m still absolutely confounded as to how that was possible. So I threw some cake ingredients in a pan, stirred a little, and baked the thing. This cake is so moist and the flavors melt together in your mouth so smoothly. It’s deliciously sweet and wonderfully warm with the powerful pumpkin and cinnamon duo. 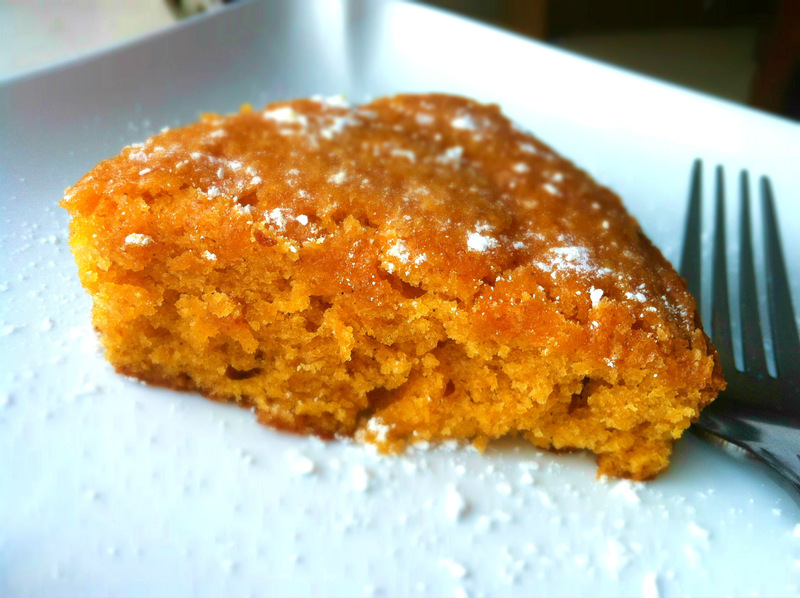 The best part is that this cake forms a sort of crust on the outside, a dark crunchy layer of caramelized sugar and pumpkin, that gets better with every passing day. It’s simply delightful. Mix together wet ingredients (the first 3), then mix in the dry. Bake for about 20 minutes at 350°F. Visit Kitchen Cici on Facebook! Didn't your momma tell you to share? I use the pumpkin puree in a soup and it is delicious! It’s like thai style soup cause of the peanut butter. 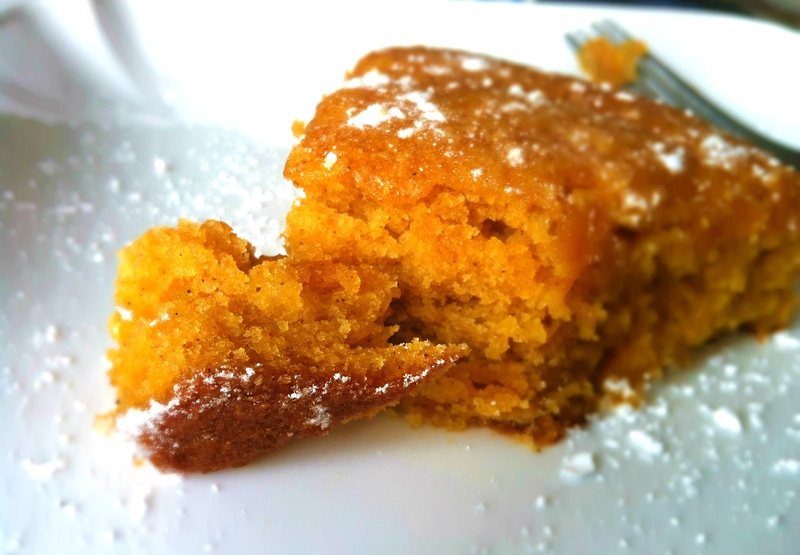 This looks amazing – and I’m always in the mood for pumpkin! I’ll give this a try for my husband since the only pumpkin thing I know how to make is pie. I hate pumpkin but he loves it. Awesome, as always let me know how it goes! I’ve tried a recipe for something similar to this, but made into cupcakes with a cheesecake-type filling in the middle (well, and gluten-free). 🙂 Your cake looks lovely, and so easy! Oh my, I can definitely imagine a cupcake incarnation of this. Cheesecake in the middle? Get outta here, that’s awesome. Thank you so much Julie!! I’m so glad you enjoy my blog. 🙂 This makes me very very happy indeed! Recount your experience to me! Hey! I did it last night with some modifications 😉 Do you mind if i post the recipe in my blog ? Kitchen Cici, why do you do this to me? I sit here in bed, cruise my reader, and I always come across something you’ve posted and instantly my hunger pains grow. Oh interesting – a steamed cake! You won’t get the lovely crust, but please let me know how it goes! 🙂 It is so easy. The crust is a huge component of texture/flavour to an un-iced cake too! I imagine the cake will be of very soft texture, we’ll see! You sure can! Also tripling is possible. And quadrupling. Et cetera.